Phuket (Thailand) – August 21, 2018 (travelindex.com) – Phuket’s tourism industry has received a major shot in the arm with the unveiling of Blue Tree Phuket, a USD40 million investment and multi-dimensional destination waterpark and entertainment complex set over 140 rai in Cherng Talay. Positioned as Phuket’s premier family attraction, Blue Tree is located within easy reach of Phuket’s popular central west coast and will be the island’s first international-standard, fully integrated waterpark and family entertainment complex, placing it at the cutting-edge of a growing demand for inland tourism on the island. 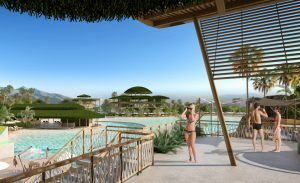 The complex will feature a compelling mix of retail, destination dining, waterpark, beach club, and health and fitness with its star attraction at its centre – Blue Tree Lagoon – designed and built by world-leading US-based water attraction specialists Crystal Lagoons. Opening in the first quarter 2019, Blue Tree is led by Michael Ayling, former Managing Director of Laguna Phuket, a destination which set a benchmark in Phuket for large-scale, high-quality integrated tourism product, who now embarks on a new pioneering project for the island. “We are delighted to be announcing what we feel will be a key component in Phuket’s tourism future as we are confident Blue Tree will appeal to families looking for high quality entertainment,” said Mr Ayling. “Phuket’s tourism market has changed considerably over the past ten years. We now see strong demand for inland attractions driven by Thai families, residents of the island and the growth of the independent-travelling international tourism market. All three markets have one thing in common: a need for high-quality, family-focused entertainment away from the beach. This is what we will deliver,” he said. Blue Tree Phuket will offer a Water and Entertainment park, a four-storey vertical Beach Club, Fitness Zone, Kid’s Club and multiple retail spaces. In addition, 17 restaurants and food outlets will cater to all tastes and budgets, centred around the complex’s star attraction: Blue Tree Lagoon. The 17,000-square-metre man-made lagoon has been designed by Crystal Lagoons, who most recently completed a mega inland lagoon project in the family attraction capital of the world, Florida. It is flanked by artificial beaches and offers an aquatic playground for family-friendly and adrenaline-driven activities such as a Slip N Fly, water slides, splash zone and even cliff jumping. Aside from utilising state-of-the-art technology to maintain water clarity, Blue Tree Lagoon also boasts eco-friendly credentials. Powered by Crystal Lagoons’ sustainable technology, the lagoon uses up to 100 times fewer chemicals and 50 times less energy than conventional swimming pool systems. Blue Tree has been in development for the past two years, from the master planning stages to partnership selections and management – with environmental sustainability a core component of the project’s DNA and fundamental to its promotion of an active and healthy lifestyle. “Blue Tree has natural borders. These are thick, mature rubber plantations that surround the project and emphasise the lush tropical environment found throughout the grounds. The name itself is testament to our commitment – a green and blue oasis in the shape of a tree, with deep roots and strong connections to the destination, its heritage and its future,” said Mr Ayling. Book your hotel at Blue Tree and in Phuket and around the world in 55 countries at best rates available. Pay at the hotel. Book now at HotelWorlds.com!